In Reception numeracy is taught as part of ‘Problem solving, Reasoning and Numeracy’, as the children get to grips with the ideas of numbers and calculations. Children will be working with numbers every day, in a range of different ways. They will be using familiar objects to help them learn about how numbers are used in everyday life, and they will also be linking numbers to topic work; for example, if they are learning about dinosaurs they could be making dinosaur pictures out of shapes. They will be encouraged to be curious and explore numbers. They will be playing number games, singing counting songs, making models and using the role-play area, as well as being introduced to the ideas of addition and subtraction. At home, try to talk about numbers – it’s important for children to see just how much maths is used in everyday life. Help consolidate your child's learning with some Reception maths worksheets and activities, and try some easy ways to engage your child with maths every day at home. 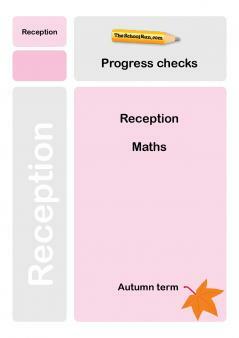 Check your Reception child's progress in maths with our free Reception maths Progress checks, three mini-tests for the autumn, spring and summer terms.